Evening: 7.00 PM to 8.00 PM. Ahobilam is a sacred place located in the Kurnool district of Andhra Pradesh, surrounded by magnificent hills of Eastern Ghats range. It is here the Supreme Godhead incarnated Himself as Lord Narasimha Swamy to kill the demon Hiranyakashipu and to save his beloved devotee Prahlada. 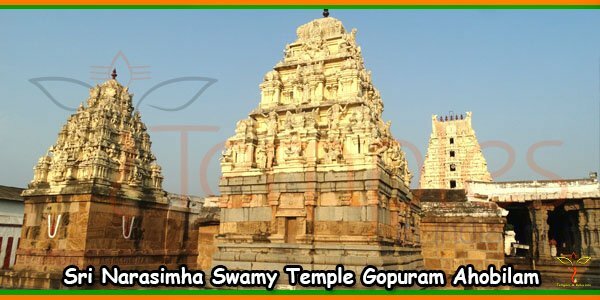 Si Lakshmi Narasimhaswamy temple situated here is one of the popular pilgrimage centres in South India. Also known as Thiru Singavel Kundram, this shrine is renowned as one among the 108 divya-deshams. The Eastern Ghats range is compared to Sri Adi Sesha, the great serpent bed of Lord Vishnu. Tirupati lies on its seven hoods, Ahobilam on its stomach and Sri Shailam on its tail. 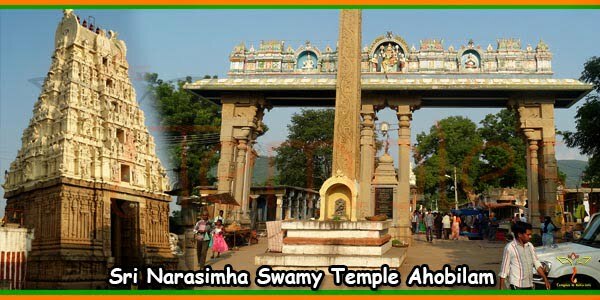 According to Brahmanda Purana, Ahobilam was the abode of the demon king Hiranyakashipu who was killed by the Lord Narasimhaswamy. The Supreme Lord incarnated as Lord Narasimha, having human body and lion head, tore apart demon Hiranyakashipu into pieces. Witnessing this divine act, the demigods praised Lord Narasimha as ‘ahobala’ meaning ‘great strength’. The word ahobilam has another meaning as ‘wonderful cave’. It refers to a cave in which Garuda meditated and received blessings of the Lord. It is said that Garuda meditated on a mountain in the Nallamallai hills range for thousands of years for having the darshan of Lord Narasimhadev. Pleased by his devotion, the Lord manifested Himself in a nearby cave and informed Garuda about the location of the cave. Garuda reached the cave and had the darshan of the Lord. He worshipped the Lord with some selected hymns. Having the darshan of the Lord and having worshipped Him, Garuda considered himself as blessed and subsequently this place became known as Ahobilam. The mountain on which Garuda performed meditation was known as Garudachala, Garudadri and Garudashailam. 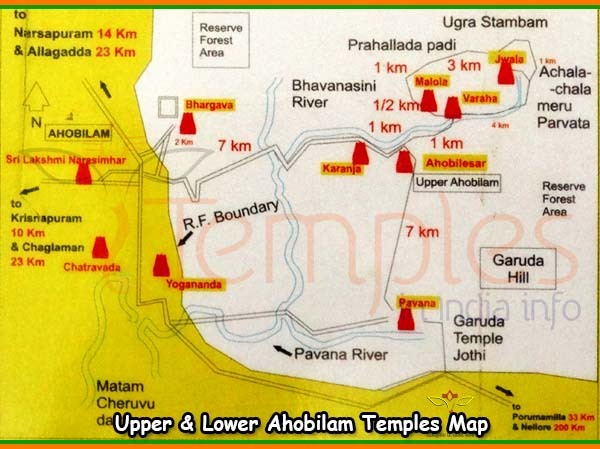 Nine temples exist in Ahobilam, which are enshrined with the self-manifested deities of the Lord Narasimha. 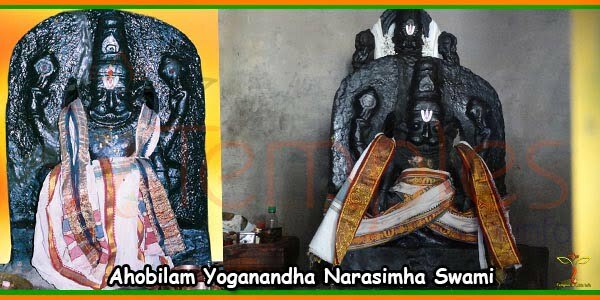 These nine deities are worshipped by the names Sri Jwala Narasimha, Sri Ahobila Narasimha, Sri Malola Narasimha, Sri Kroda Narasimha, Sri Karanja Narasimha, Sri Pavana Narasimha ,Sri Bhargava Narasimha, Sri Yogananda Narasimha, and Sri Kshatravata Narasimha. There are two divisions of the Ahobilam, which are : Upper Ahobilam or Eguva Ahobilam and the Lower Ahobilam or Diguva Ahobilam. Upper Ahobilam, situated at about ten kilometres from the Lower Ahobilam, includes the following temples: Ahobila Narasimha, Krodha Narasimha, Jwala Narasimha and Malola Narasimha. Lower Ahobilam constitutes the following temples: Sri Yogananda Narasimha, Chatravatha Narasimha, Pavana Narasimha and Bhargava Narasimha. 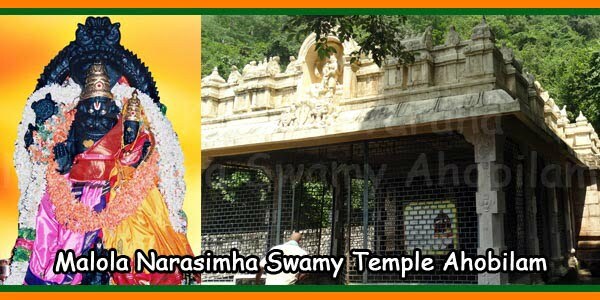 The temple of Sri Karanja Narasimha is situated on the way from Lower Ahobilam to Upper Ahobilam. There is a popular belief among the devotees that the nine planets acquired their power after worshipping these nine forms of the Lord and hence whoever worships these nine forms can overcome the ill effect of the respective planet. Sri Ahobila Narasimha is the main temple and the oldest one among the nine temples in Ahobilam. The shaligrama form of Ahobila Narasimha is in Ugra bhava (fierce) and in the sukhasana posture, tearing apart the chest of Demon Hiranyakashipu. Prahlada can be seen in front of the Lord. Devotees can also have the darshan of Chenchu Lakshmi, the divine consort of the Lord. The goddess is in padmasana pose. Sri Kroda Narasimha is also worshipped by the devotees as Varaha Narasimha. It has the face of a boar and is regarded as a very special form of Lord Narasimha Swamy. Lord Narasimha killed Hiranyakashipu but he was very angry with Lord Brahma for the boon he had granted to Hiranyakashipu. He called for Lord Brahma but Brahma was afraid to come near him and the Vedas fell down from his hands. Bhumi Devi held the Vedas and took with her to Patala to protect them. Since the Vedas were missing, the demigods approached Lord Narasimha for his help. The Lord took the form of Kroda, an animal having a single front horn, and went to Patala to retrieve the Vedas. He came out from Patala with Bhumi Devi sitting above His horn. After retrieving the Vedas, Lord took the form of Sri Kroda Narasimha and sat at this temple. By that time he cooled down. Then Lord Brahma approached him begging for forgiveness and he requested to give him the Vedas. Lord Narasimha declined Brahma’s request saying that Brahma was not a responsible person because he already lost it due to carelessness. Then Brahma suggested to give Vedas to Lakshmi-devi. Lord agreed with Brahma and gave him darshan as Sri Malola Narasimha. 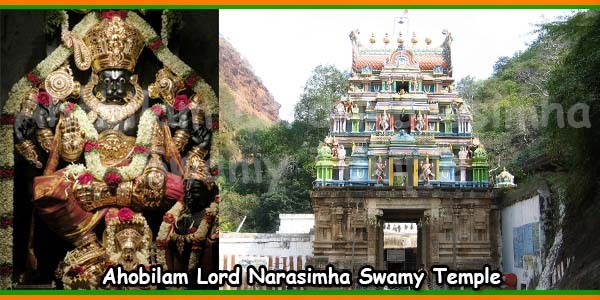 Devotees can have darshan of both Sri Kroda Narasimha and Sri Lakshmi Narasimha in this temple. It is said that Lord Narasimha developed attachment to Chenchu Lakshmi which annoyed Lakshmidevi, and the Lord is seen here as if he is trying to pacify Lakshmidevi. Here devotees can also have darshan of Sri Varaha Tirtha. To reach the temple of Sri Krodha Narasimha, the devotees have to do a little bit of trekking. From the Ahobila Narasimha Temple, they have to walk further along the banks of Bhavanashini River to reach this temple. The first Jeeyar of the Ahobilam mutt interpreted on the Sribhashya and delivered Bhagavad-Gita Kaalakshepam to the then 74 simhasanadipatis near this place. To reach Malola Narasimha Temple one has to climb few stairs from the Kroda Narasimha temple. Here, the deity of Lord Narasimha is in a peaceful form and Lakshmidevi is also present near him. The word ‘Ma’ refers to Mother Lakshmi and ‘lola’ means beloved. Lord Narasimha is the beloved of Mother Lakshmi and hence he is worshipped as Malola Narasimha. This temple is also known as Markonda Lakshmi Kshetra. Among the nine Deities of Narasimha, the utsava murthy of Sri Malola Narasimha travels with the Jeeyar of Ahobila Mutt. There is a specific reason behind it, which is as follows. Srinivasacharya was a young devotee of Melkote. One day Lord Lakshmi Narasimha appeared in his dream and told him to go to Ahobilam, take sannyasa and continue his divine service from Ahobilam. Unable to believe this dream, Srinivasacharya sought the advice of his guru, Sri Ghatikasatam Ammal, who was also known as Varada Vishnuvarcharya. His guru advised him to follow the instructions of the Lord without delay. With the blessings of his guru, Srinivasacharya rushed to Ahobilam, where he was received by Mukundaraya, a local chief, who had been instructed by the Lord to receive Srinivasacharya at Ahobilam. Appeared in the form of a saint, Lord Narasimha initiated sannyasa to Srinivasacharya and established the Ahobilam Mutt. The Lord conferred him the name Sathakopa Jeeyar and instructed him to go door-to-door and preach the message of Vaishnavism, and carry with him the utsava murthy of the Lord. The Lord also told him to act as the spiritual master of the disciples. Since the Lord had not mentioned about any specific utsava murthy, Sri Sathakopa Jeeyar was confused as to which utsava murthy he should carry with him. He meditated on the Lord and requested him to choose the utsava murthy. Immediately the utsava murthy of Sri Malola Narasimha flew from the temple and reached his hands. The utsava murthy of Sri Malola Narasimha is decorated with a Paduka which indicates that the Lord is ready to go ahead on a tour. Since then the utsava murthy of Sri Malola Narasimha has been travelling with the Jeeyars of Ahobilam Mutt and showering its blessings to the devotees. Sri Jwala Narasimha is several steps away from the temple of Malola Narasimha. It is suggested that instead of climbing, the devotees can return to Krodha Narasimha Temple and then walk along the banks of Bhavanashini River to reach Sri Jwala Narasimha temple. 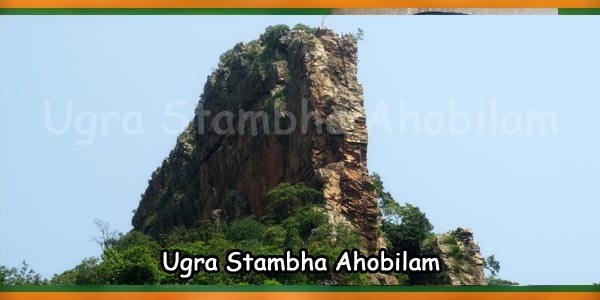 The temple of Sri Jwala Narasimha is situated on a hill called Achalachaya Meru which is on the base of Ugra Stambha. One has to cross the waterfall of the Bhavanashini River to reach this temple. This is the exact spot where Lord Narasimha killed Hiranyakashipu. Here the anger of Lord Narasimha reached its peak. The Deity of Lord Narasimha in this temple is seen tearing apart Hiranyakashipu with His powerful nails. Other two forms of the Lord can also be seen: Sthanu Narasimha, emerging out of the pillar; and Veera Narasimha, fighting with Hiranyakashipu. Rakta Kunda is the small pond near this temple, where Lord Narasimha washed His blood-stained hands and the color of the water turned red. Still today, one can see red stains around this tirtha. The crystal clear water in this pond is very sweet. Lord Narasimha, after killing Hiranyakashipu, taught Prahlada few yogic postures. In this temple, the form of the Lord is seen as seated in padmasana posture with yogapatta around His legs. It is believed that Lord Brahma visited this place once when he was in a disturbed mind and by worshiping the Lord and practicing Yoga, he attained peace and returned. The Deity was being worshipped in a deep tunnel but for the convenience of worship, He was taken out from the tunnel and installed here. Here the Lord is in a unique form having a very beautiful smile on His face. Since the Lord is worshipped under a peepal tree, surrounded by the thorny bushes, He is popular here by the name Chatravatha Narasimha. Left hand of the Lord is in the tala mudra. Tala mudra cannot be seen in any other form of the Lord in any other temple. It is said that once two gandharvas named Haha and Hoohoo from the Meru Mountain came here and entertained the Lord with sweet music. The Lord blessed them to become famous as great singers. Lord Indra and the demigods worshipped Chatravatha Narasimha here and requested Him to kill the demon king. Hence this temple is also known as Devata aradhana kshetra. Since this temple is on the banks of the River Pavana, the Lord is known as Pavana Narasimha. Here the Lord is in the most peaceful form amongst the nine Narasimhas. Here the Lord is also known as Pamuleti Narasimha Swamy. It is believed that Lord liberates devotees from the all their sins of past and present lives that might have committed by them knowingly or unknowingly. At this place, Sage Bharadwaja was relieved from the great sin of brahma-hatya. This temple is situated far in the middle of the forest and the devotees have to climb several steep steps to reach this temple. The steps begin from near the temple of Sri Ahobilam Narasimha. Devotees can also access the temple by travelling in local jeeps; however it is not recommended as the roads are not good. It is also advised to avoid visiting after 5 pm because of the presence of wild animals in the forest. o be the most aggressive form. The temple is situated on the banks of Akshaya Tirtha, which is equally regarded as the sacred Pushkara Tirtha. Parashurama used to bathe in this Theertha and its water is used for the worship of Lord Bhargava Narasimha. Sage Vasishtha and other sages had performed penances in this place. Devotees can have darshan of Prahlada at the lotus feet of the Lord. This temple is amidst a thick forest and since it is a hilly terrain, it can be reached only by local jeep or autos. The Deity of Lord Narasimha is placed under the Karanja Tree, hence the Lord is also known as Karanja Narasimha. Karanja Tree is called as Honge Mara in local language. The Lord is also known as Saaranga Narasimha because He holds the bow named Saaranga. There is a story behind this. Once, Hanuman was mediating and chanting the holy name of Lord Rama. Suddenly Lord Narasimha appeared before him and asked why he called him. Hanuman told him to go back because he was calling Rama’s name. Narasimha said that he was Rama and since Hanuman called him, he came here. Hanuman said that he could not be Rama because he did not have the form of Rama. Immediately Lord Narasimha manifested Himself as Rama with bow in one hand and Sudarshana in the other hand and Hanuman got convinced. From then onwards the Lord was worshipped in the form of Sri Karanja Narasimha. There is a small deity of Hanuman in the temple. Sage Durvasa cursed Sage Gobila to become a stupid person. 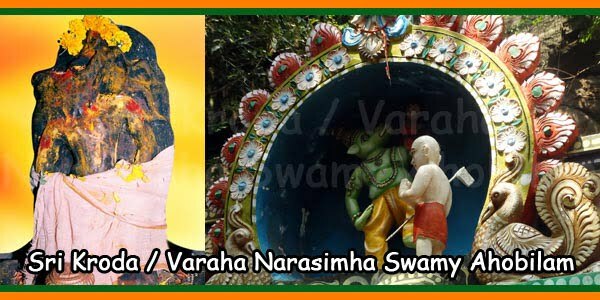 He started worshipping the Lord by reciting Narasimha Mantra. The Lord was pleased with him and blessed him that he would become a very learned person and would attain liberation in due course. Devotees who seek knowledge come here and worship for Lord’s grace. This mountain is believed to be a part of the pillar from which Lord Narasimha emerged to kill Hiranyakashipu. When the Lord emerged out of the pillar, the whole pillar shattered into pieces. On His first step produced 172 sounds which were the first basic codes of the 172 classical ragas. Out of this, only 52 melakarta ragas exist today and one cannot even master them completely. Ugra Stambha is also called as Ukku Stambha. Ukku in Telugu means steel. On the top of Ugra Stambha there is a lotus feet impression of Sri Chaitanya Mahaprabhu who visited this place during his trip to South India. This is a cave situated behind the Malola Narasimha Temple in Upper Ahobilam at about 400 meter walk from Malola Narasimha temple through the forest and the narrow path of the cliff. There is a cavern in this cave. When demons threw Prahlada from the cliff, he fell through this cavern and was held by Lord Narayana. Around this cave, Prahlada wrote ‘om namo narayana’ and ‘om namo bhagavate vasudevaya’ on the rocks. Those transcendental letters can still be seen here. 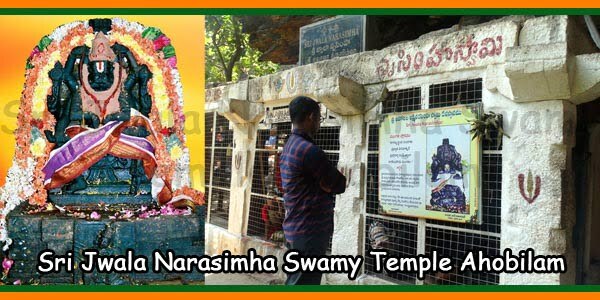 In this cave, one can also have darshan of Sri Yoga Narasimha, Sri Sudarshana and Sri Narayana Murthy. The temple of Sri Prahlada Varada, where Lord Narasimha is seen blessing Prahlada, is situated in Lower Ahobilam. 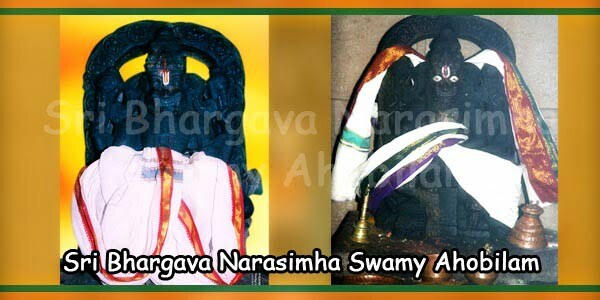 Lord Narasimha was the family deity of Sri Srinivasa Govinda of Tirupati. Since the Lord was in the fierce form, Srinivasa installed the Deity in the peaceful form and worshiped Him before he married Padmavathi Devi. 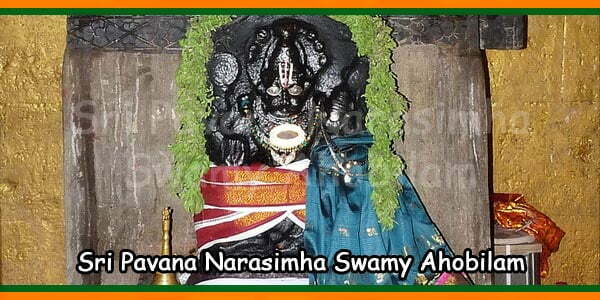 The utsava Deities of Sri Pavana Narasimha and Jwala Narasimha are worshiped in this temple. This place is also popular by the name Chinna Ahobilam or Diguva Tirupati. Every Friday Ammavari Abhishekam and Uyyal Seva. 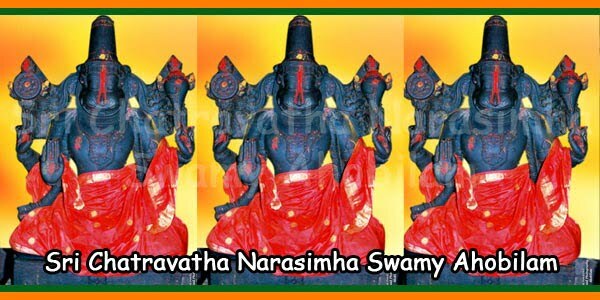 4) Swathy (Swamy vari Janma Nakshatram).